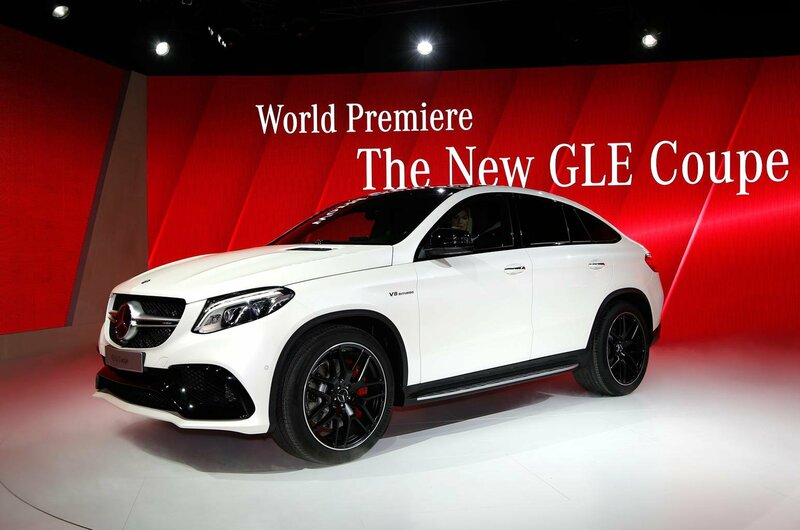 2015 Mercedes GLE63 AMG revealed at Detroit show | What Car? The Mercedes-AMG GLE63 Coupé has been revealed at the Detroit motor show, and will take on the BMW X6 M and Porsche Cayenne Turbo S when it goes on sale in the UK in June. This is the flagship version of the GLE Coupe. It is distinguished from lesser GLE Coupes by a series of AMG exterior styling cues. It gets a different front bumper, a twin-blade grille, standard LED headlights, twin-dome bonnet, more substantial cladding on the wheelarches, a rear lip spoiler and a rear bumper with diffuser fins and twin chromed tailpipes. It also sports a bespoke-coloured front bumper with black elements, along with titanium grey alloy wheels. The GLE63 Coupe comes with a choice of two versions of a twin-turbocharged 5.5-litre V8 engine. The standard version delivers 549bhp and 516lb ft of torque, while the S version musters 577bhp and 560lb ft, and can cover 0-62mph in as little as 4.2sec. The top speed for both GLE63 Coupé models is limited to 155mph, while their combined fuel consumption is put at 23.7mpg, along with average CO2 emissions of 279g/km. The GLE63 Coupe uses a specially tuned version of Mercedes' AirMatic air suspension setup and an Active Curve system that provides added body control and greater cornering speeds than regular GLE models. The steering has also been specially tuned. The GLE63 comes with 21-inch wheels as standard, while the S version has 22-inch rims. It also offers five different driving modes: Comfort, Sport, Sport Plus, Individual and Slippery Transmission, the latter of which has been developed to provide optimum traction and maximum driving stability in adverse road conditions. Pricing is yet to be announced, although Mercedes-AMG suggests the standard GLE63 Coupe will be pitched close to the existing £86,995 second-generation ML63 AMG, with which the new performance SUV shares such of its mechanical package. The new BMW X6 M’s twin-turbocharged 4.4-litre V8 produces 564bhp and 553lb ft, while the twin-turbocharged 4.8-litre V8 used by the new Porsche Cayenne Turbo S provides 562bhp and 590lb ft. So the S model has the edge in terms of power, although both rivals are capable of matching or bettering the GLE's 0-62mph time.